I've used various versions of qgis to make maps and never had a problem scaling them until now. My system updated, including my version of qgis which has the scale option but doesn't apply it to the map when clicked on. Any suggestions, or is this a glitch in the software?? 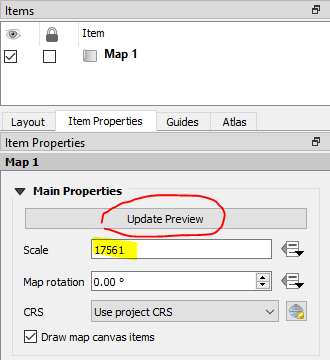 QGIS 2.18 does allow you to change the map scale in the print composer. Simply go to item properties and type in a new value in "Scale" box. You may have to click the "update preview" button to see the change. This screenshot is from version 3.4, but it worked the same in 2.18. Please note: 2.18.20 is not "the new version of QGIS." It's not even the latest sub-version of the old long-term release (LTR); the latest sub-version of the old LTR (2.18) is 2.18.27. The current LTR is 3.4.3. Not the answer you're looking for? Browse other questions tagged qgis qgis-2.18 or ask your own question. Why do Print composer templates not save my maps in their entirety? How to handle GDAL dataset error when accessing Arcgis Online world imagery data? Citing old version of QGIS in bibliography of assignment?